Q: When did you first have a sense of your vocation? Now, I also wanted to be a professional baseball player; a missionary surgeon; I was fascinated with garbage collection; I wanted to work for the FBI; I presumed I would be married, simply because that was the culture in which I grew up. My experience in this is not particularly unique, since it’s not unusual for people to try on ideas of who they want to be, what they want to do. But most people probably don’t have monk on their short list. Yet that thought about being a monk never left me. 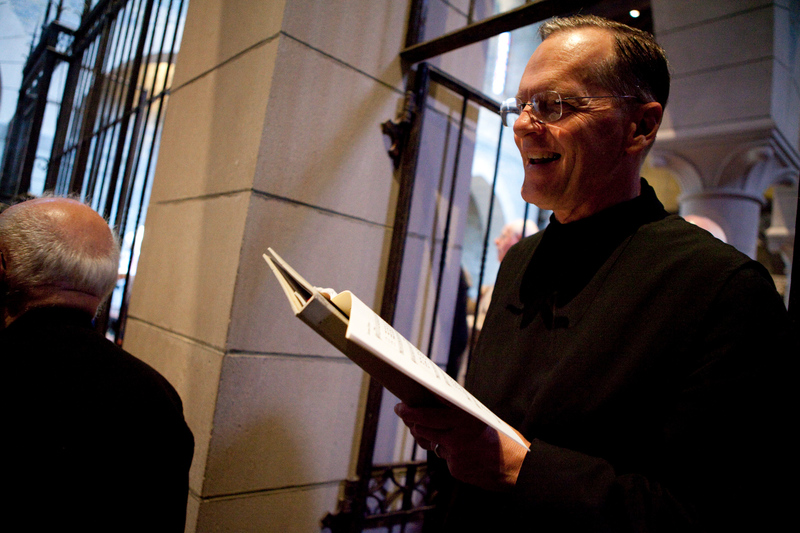 But becoming a monk is not unlike becoming married: you don’t just open up the phone book, close your eyes, let your finger fall on a name, and say, “Okay, here’s the one.” There’s chemistry involved between an individual and a monastery, just as there is in dating, or in contemplating a life partnership with another person. So coming to a monastery is a very specific relationship. And I had never met “the one.” That is to say, I had never met the Monastery. I visited lots of monasteries for retreats—and there was always a kind of homecoming for me in that experience—but because I hadn’t as yet met the one, since the right fit had never come my way, I assumed that it wasn’t going to. 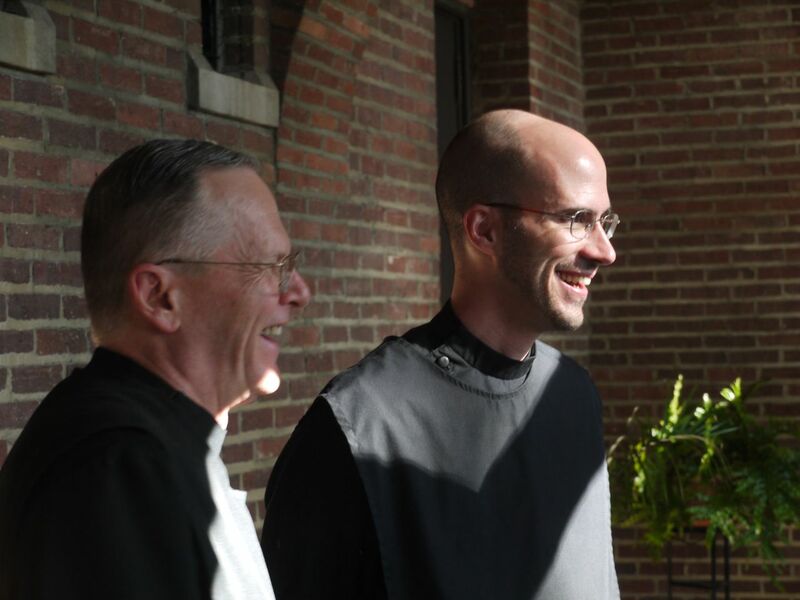 I had come to the conclusion that this deep interest in monasticism was not a vocation; it was an avocation—an informing part of my life, and a very important one at that, but not my life’s calling. Q: What changed that belief? I met up with SSJE. 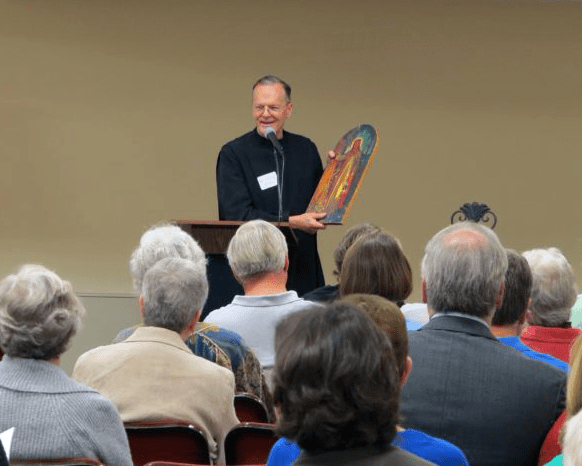 I’d determined that if monasticism was ever to come my way, it couldn’t be in a cloistered monastery, where I was tucked away without an active ministry. I knew that I have enough energy and extroversion in my mix, my soul would suffocate in such an environment. But likewise, I knew that I couldn’t be something like a Franciscan, where I would be praying on my feet. I would burn out; I’d have a shelf life of about eighteen months. I knew I’d need something in the middle of those poles, but I’d never found it. When I met up with a Brothers from SSJE while I was in seminary, for the very first time I thought, “Maybe this could be it,” because SSJE has a quite traditional, contemplative side—we pray the hours, we live under traditional monastic vows of poverty, celibacy, and obedience—and we also have a very active ministry apostolate. Amazingly enough, SSJE’s balance was the very thing I was looking. I hadn’t known it existed. Q: So how did you follow-up on that spark of interest? I made a visit to SSJE—a secretive visit. I didn’t tell the novice guardian that I had interest in the community or in a vocation. I didn’t want to put the spotlight on myself. That would feel like pressure. I just wanted to do some sniffing around on my own terms, to get a sense of who these Brothers were. During that visit, I remember that the first service I attended was Evensong. I sat in the Chapel increasingly dazed. After Evensong, rather than going with the other guests to the Refectory for the evening meal, I went back to my room in the Guesthouse and closed the door. And I sat at the edge of my bed and wept. I wept because I thought, “After all of these years…” I was thirty-four, and I’d had that dream when I was twelve. Now I thought, “After all this time, maybe this is it.” I was crying because I was full of awe at what I’d just experienced, but also out of fear and dread, because I didn’t know if I’d have the courage and inner resolve to carry through with this exploration, or to speak with my family and other friends, whom I thought would greet this interest in a very discouraging way. I didn’t know if anyone else in my entire life would understand this. So there I sat on the edge of my bed. To be honest, I was half-hoping I would still be able to get this out of my system. I knew I needed to go home and take stock, which is exactly what I did. 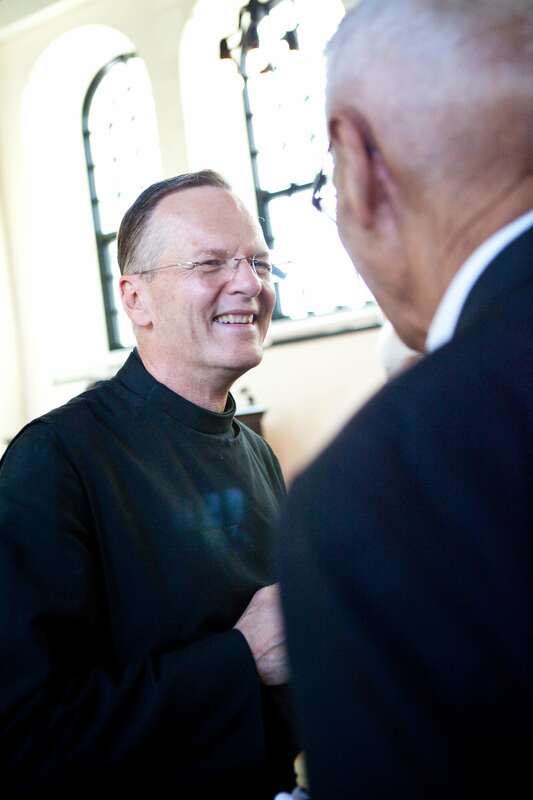 I was serving then in a parish in the diocese of Chicago, and quite happily, but there was something missing—a sense of belonging and a context in which to belong. God has created us all with this need to belong. We see a beautiful picture of belonging in the Trinity: this interrelatedness of the Godhead, the community of God. I knew I had quite a deep need—in some ways an almost desperate need—to belong, the whole of me. Yet what was increasingly clear to me was that this need to belong was a real paradox: as much as I needed to belong to someone, I also knew that marriage wouldn’t be enough, that one other person couldn’t be enough. Somehow or another, I knew this. And I suspect that there is some awareness of what I’ve just described in the common genes of the religious down through the centuries. Q: So after that first visit, how did you finally make the decision to come to SSJE? Was it a struggle for you? I just woke up to it. It was like waking up with a kind of clarity: “This is it.” It wasn’t as if I had a piece of paper with a line drawn down the middle, with Xs on each side for the advantages and disadvantages of coming. It was more like waking up to the rightness of this—the rightness of coming to test this desire out further. That’s the operative verb that’s used, down through the centuries, in the religious life: to test a vocation. The metaphor comes out of metallurgy. Testing is when metal is put into the fire to burn away the dross. The metal will either completely consume, because it is all dross—which can be painful and embarrassing, but clarifying—or conversely, the metal will be put into the fire, the dross will be burned away, and what is left is a truer form of what there was before. For me it was the latter. I think of the process of discerning a vocation as God dropping these breadcrumbs on the path ahead, to lure us into places. I came freely and full of desire to be here. I very much came knocking at the door. Once inside the door, there’s an awakening of all the reasons—perhaps the real reasons—why God called us here. I had arrived at the Monastery with a few pairs of clothes and only a satchel of books—I’d traveled very lightly—but my soul was clogged with such an awful weight that I’d never imagined. I had a lot more stuff, especially around my identity and how I wanted myself to be perceived, than I’d ever realized. I was talking with a Brother some years later, about discovering that I had so much baggage. He said to me, “Curtis, that’s not baggage, that’s freight!” I become aware of this freight early into my time at SSJE. I was called into this monastic community in part to do that work of detachment and letting go. I couldn’t have known that before I came here (and if I had known, I probably wouldn’t have come). Yet I was called here because this is the place where I could be most real. Here I could become who I truly am. My calling here was about being really present to life—which is where God will be most present. I can’t imagine any other way, any other context, in which my life could have unfolded. In that way I’m myopic. And we all are: we only know what we know. My experience is that nothing else would have been possible for me; yet I am also aware that I have made many mistakes in life; and I witness that other people have made mistakes in life. I would never want to imply that there is only one right way for each of us, and that if we don’t find it then we’re screwed. There is also the reality of redemption. 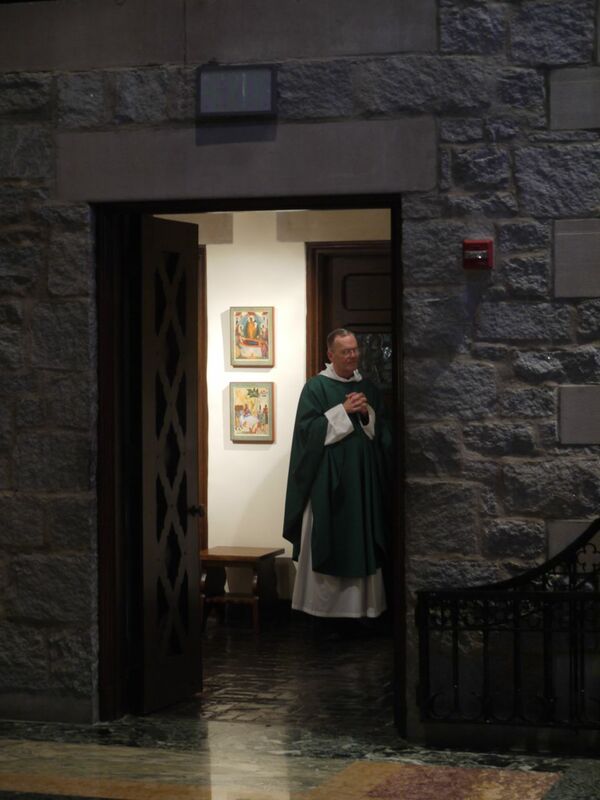 Discerning a vocation is just a beautiful manifestation of God’s waiting on us—waiting, in the sense of readiness, waiting for the fullness of time; but also waiting in the context of a waiter, stooping to meet us where we are. That’s how God meets us: where we are. Discerning a vocation is the reality of life being able to be retrieved, or restored, or recovered from all the mixed bag that is life. Sometimes we get it right, sometimes not. For me, this was the right way. But God waits on us to help us find that right way where we are, every moment. Q: What would you say to someone who did not know what was the right way for them? First, God has created us out of love and God is well apprised of what we are, who we are, how we are. While every relationship with God is intimately personal, it’s not private. In the Christian tradition, there has always been an understanding that the context in which we live and breathe and have our being, is community. So don’t assume that you can do this alone. We need help when it comes to finding our way, hearing our calling and claiming it. Ask those who know you to help you in discovering your calling. Secondly, there’s an insight from Dom Sebastian Moore, an English Benedictine who taught at Boston College. He says: “Desire is not an emptiness longing to be filled; desire is a fullness longing to be in relationship. Desire is love trying to happen.” I believe that God lurks behind all of our desires for what we want to be and become. Our desires are the breadcrumbs: God’s way of luring us. So take your interests and desires—whatever you find compelling, intriguing—quite seriously. There is something going on in our interests and desires that needs to be unwrapped, probably with some help. But no matter how disconnected or crazy our thoughts or interests may seem, if we go deep enough to the ground of our being, we will find God as the initiator of that desire. Finally, how do you know when you’ve found the right fit? There’s an old monastic insight, “Freedom is found in the context of limitation.” I think that, however good and right the fit may be, it’s never going to be so perfect that it will keep us off our knees. This life is proleptic: a taste of what’s to come. It’s a real experience, but it’s never the whole deal. By God’s grace, there will always be things that are not perfect, not complete, which keep our hearts broken open and our souls on our knees, lest we confuse this life with eternity. So no matter how right the fit is—and this life at SSJE has been just a huge grace for me—it’s never going to be completely complete. And there’s something graceful about that kind of inner vacuum. We are a reflection of God, made in God’s image, and we are longing after, thirsting for, desiring, hungering for God. That desire will never be completely sated in this life—however good our various fits are; however good our belonging is. There will always be the longing for something more. And God is behind that longing, too. God is always More.